We know that every kitten is unique in her own, extraordinary way. We also know she needs nutrition specially formulated for her growing body. 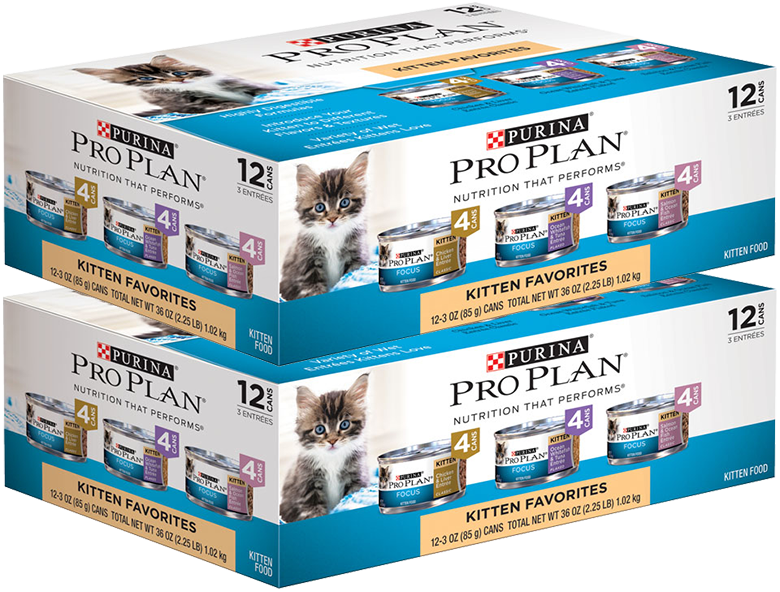 That's why we're proud to offer this Pro Plan kitten food variety pack, which features the great nutritional benefits of Pro Plan with a variety of delicious flavors. Variety Pack includes: 8 3-oz. 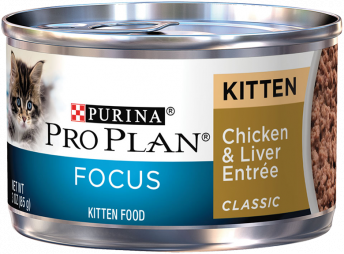 cans of Pro Plan® Focus Chicken & Liver Entrée Classic (Kitten), 8 3-oz cans of Pro Plan® Focus Ocean White Fish & Tuna Entrée Flaked (Kitten) and 8 3-oz. cans of Pro Plan® Focus Salmon & Ocean Fish Entrée Classic (Kitten). Choose a quantity and delivery schedule. Add your item to the cart and order. 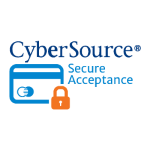 Each order's payment is processed when it is shipped. No additional fees and you can cancel a subscription at any time. Chicken & Liver Entrée Classic (Kitten): Chicken, Liver, Fish, Meat By-Products, Water Sufficient for Processing, Artificial and Natural Flavors, Calcium Phosphate, Rice, Guar Gum, Potassium Chloride, Added Color, Salt, Taurine, Thiamine Mononitrate, Zinc Sulfate, Vitamin E Supplement, Ferrous Sulfate, Niacin, Copper Sulfate, Calcium Pantothenate, Manganese Sulfate, Vitamin A Supplement, Menadione Sodium Bisulfite Complex (Source of Vitamin K Activity), Pyridoxine Hydrochloride, Riboflavin Supplement, Vitamin B-12 Supplement, Biotin, Folic Acid, Vitamin D-3 Supplement, Potassium Iodide. E-4651. 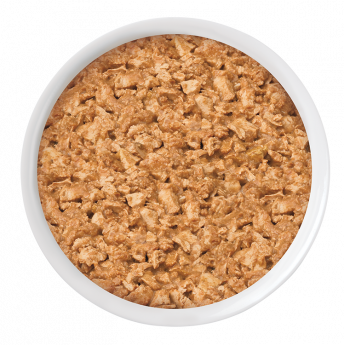 Ocean White Fish & Tuna Entrée Flaked (Kitten): Water Sufficient for Processing, Ocean Whitefish, Fish, Liver, Wheat Gluten, Meat By-Products, Chicken, Tuna, Soy Flour, Soy Protein Concentrate, Artificial and Natural Flavors, Added Color, Calcium Phosphate, Potassium Chloride, Xanthan Gum, Taurine, Carrageenan, Choline Chloride, Salt, Vitamin E Supplement, Thiamine Mononitrate, Zinc Sulfate, Ferrous Sulfate, Niacin, Calcium Pantothenate, Copper Sulfate, Vitamin A Supplement, Manganese Sulfate, Menadione Sodium Bisulfite Complex (Source of Vitamin K Activity), Pyridoxine Hydrochloride, Riboflavin Supplement, Vitamin B-12 Supplement, Biotin, Folic Acid, Vitamin D-3 Supplement, Potassium Iodide. D-4666. Salmon & Ocean Fish Entrée Classic (Kitten): Salmon, Ocean Fish, Liver, Meat By-Products, Water Sufficient for Processing, Chicken, Artificial and Natural Flavors, Calcium Phosphate, Rice, Added Color, Guar Gum, Potassium Chloride, Salt, Choline Chloride, Taurine, Vitamin E Supplement, Thiamine Mononitrate, Zinc Sulfate, Ferrous Sulfate, Niacin, Copper Sulfate, Calcium Pantothenate, Manganese Sulfate, Vitamin A Supplement, Menadione Sodium Bisulfite Complex (Source of Vitamin K Activity), Pyridoxine Hydrochloride, Riboflavin Supplement, Vitamin B-12 Supplement, Biotin, Folic Acid, Vitamin D-3 Supplement, Potassium Iodide. F-4652. Animal feeding tests using AAFCO procedures substantiate that Pro Plan Focus Kitten Chicken & Liver Entrée Classic provides complete and balanced nutrition for growth of kittens. FEEDING: Feed one can per 1-1/2 - 2 pounds of body weight daily. Divide into three or more meals. Continue to adjust as needed to maintain your kitten in ideal body condition and avoid excess weight gain. Animal feeding tests using AAFCO procedures substantiate that Pro Plan Focus Kitten Ocean Whitefish & Tuna Entree Flaked provides complete and balanced nutrition for growth of kittens. Animal feeding tests using AAFCO procedures substantiate that Pro Plan Focus Kitten Salmon & Ocean Fish Entrée Classic provides complete and balanced nutrition for growth of kittens.